Get Your Copy of Disney Planes Blu-ray Combo Pack in Time for Christmas! Disney’s heartwarming family comedy, Planes, revved up with high-flying action and adventure, landed in homes and mass retailers nationwide on November 19th. This endearing underdog story about a crop dusting plane named Dusty with sky-high dreams is now available in Blu-ray, DVD, Digital HD and On-Demand featuring a cargo hold full of exciting bonus features. Guaranteeing hours of fun, Disney’s Planes Blu-ray Combo Pack is the perfect gift for “ladies and gentle-planes” of all ages this holiday season! I received Disney’s Planes Blu-ray Combo Pack to facilitate this review, and I loved it so much that I downloaded the digital copy onto my iPad so that I can watch it whenever I want! I love that Disney movies allow you to download a digital copy so that you can take your favorite Disney movies with you everywhere you go! If you haven’t seen Disney’s Planes yet, don’t fret. I never had an opportunity to go see it in the movie theater either and just saw it for the first time when my copy arrived in the mail! You can see an 8-minute peek of the film here: http://youtu.be/WBi4FWOgNPc. Disney’s Planes was along the same lines of Disney’s Cars, which we really loved too. Dusty is a crop duster with big dreams of becoming a racing plane (sound familiar?). While Dusty is sweet as can be, he’s not exactly built for speed, being a crop duster and all. Oh yeah, and he’s afraid of heights! I won’t give too much away, but rest assured, Dusty rises to the occasion, with a little help from his friends! I loved the entire movie; it had the perfect blend of sweet, emotional parts and hilarious comedy too! Directed by Klay Hall (King of the Hill, The Simpsons), produced by Traci Balthazor-Flynn (Return to Never Land, Bambi II, The Little Mermaid: Ariel’s Beginning) and written by Jeffrey M. Howard (Tinker Bell, Tinker Bell and the Great Fairy Rescue), Disney’s Planes flew to the top of the U.S. box office this summer, holding altitude as the #1 family movie in America four weekends in a row. Disney’s Planes is propelled by a star-studded voice cast that includes Dane Cook (Louie My Best Friend’s Girl, Dan in Real Life) as Dusty, Stacy Keach (The Bourne Legacy, Nebraska) as Navy Corsair Skipper, Teri Hatcher (ABC’s Desperate Housewives, Coraline) as say-it-like-it-is mechanic Dottie, Julia Louis-Dreyfus (Veep, The New Adventures of Old Christine, Seinfeld) as Rochelle, Priyanka Chopra (Barfi!) as Ishani, John Cleese (Monty Python, A Fish Called Wanda) as Bulldog, Carlos Alazraqui (James Garcia on Comedy Central’s Reno 911) as El Chupacabra, Roger Craig Smith (Captain America in Disney XD’s Marvel’s Avengers Assemble, voice of Sonic The Hedgehog in Wreck-It Ralph) as the world champion racer Ripslinger, Val Kilmer (Batman Forever, Top Gun) as Bravo and Anthony Edwards (TV’s ER, Top Gun) as Echo. You can buy Disney’s Planes on Blu-ray 3D Combo Pack (Blu-ray 3D + Blu-ray+ DVD + Digital Copy), a Blu-ray Combo Pack (Blu-ray + DVD + Digital Copy), a DVD (DVD + Digital Copy), Digital HD and On-Demand too! Check out the different formats available on Amazon.com (that’s my affiliate link below) – right now you can get Disney’s Planes Blu-ray Combo Pack for just $16.99! 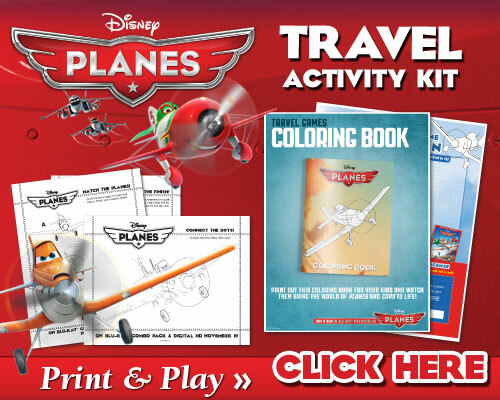 You’ll also want to check out this fun Disney’s Planes Travel Activity Kit too! This is such a great movie. My kids loved it. I was so happy when I won this at a Twitter Party, I can’t wait for it to get here. I’m going to get this as a stocking stuffer for my girls. This is one of my son’s favorite movies! We’ve watched it a crazy amount of times.